The overriding approach in Brahms’s conception of a concerto was symphonic, on the grandest of scales. Compared to the smaller dimensions and expressive ambitions of the great concertos not only of Mozart and Beethoven, but of Mendelssohn, Schumann and Dvorák, Brahms’s are alpine epics. 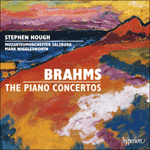 All Brahms’s concertos are supremely demanding on the soloist (or soloists), but the two piano concertos have little conventional virtuosic showing-off. Nor is the soloist always the centre of attention. In Brahms’s concertos the soloist is a participant in a dialogue—a spotlighted and nearly non-stop participant, but still part of a symphonic dialogue. In the piano concertos the keyboard style is grand and two-fisted, almost orchestral in itself. 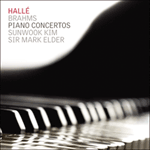 Brahms’s approach is set in the opening pages of the Piano Concerto No 1 in D minor, Op 15: massive and dramatic, its sound and its juxtaposition of D minor and B flat major echoing Beethoven’s Ninth Symphony. The inspiration of this concerto was tragic and immediate. In September 1853 the twenty-year-old Brahms knocked on the door of Robert and Clara Schumann’s home in Düsseldorf and played them a few of his pieces. When he left, Schumann wrote in his journal: ‘Visit from Brahms (a genius).’ Soon after the Schumanns had met Brahms, Robert wrote an article called ‘New Paths’ in which he declared this unknown student not only a genius but the coming saviour of German music. From Robert’s article many thing flowed. Suddenly the whole of musical Europe knew the name Brahms. But Brahms understood all too well what Schumann had unintentionally done: thrown him up on a pedestal before he had proved himself. As Brahms was contemplating that dilemma he received news of something far worse: Robert Schumann had jumped into the Rhine in a suicide attempt. Robert was pulled out of the river and placed in an asylum, where he died three years later. During that period Brahms and Clara fell in love (more or less unspoken), and he began to try and cope with the creative burden Robert had laid on him. It was during those years that he painfully and painstakingly composed the First Piano Concerto. This composition appears to have been begun amid the nightmare of Schumann’s collapse. Within a week of Robert’s suicide attempt, Brahms had drafted three movements of a two-piano sonata in D minor. In the following months the sonata turned into a draft of a symphony that refused to take wing. Finally he began over again with just the first movement, refashioning it as a piano concerto. This movement was his first piece for orchestra and by far the most ambitious thing he had attempted. Immediately he found himself struggling with writing for orchestra and managing a gigantic, complex form. Yet he kept pounding away at the piece. After nearly five excruciating years, he finished the three movements of the D minor Piano Concerto in spring 1858. What he created remains one of the longest, most powerful and most formidable of all concertos. It begins on a note of high drama, an ominous low D in the basses and snarling horns, with wild shivering trills above. That opening was the most turbulent in the repertoire at the time, with an expressive urgency that Brahms rarely attempted again and never surpassed. Surely the impetus for this work came from his youthful turmoil. If the vertiginous opening is applied to the image of a desperate man leaping into the water, it is almost cinematically apt. After the searing opening pages, the monumental first movement unfolds in an atmosphere of high drama, yet still not in programmatic but in abstract terms, a version of the usual concerto first-movement form—exposition, development, recapitulation and coda. Through a welter of themes the pianist has to portray something like all the contending characters in a drama. This remains one of the longest of concerto movements, physically and mentally one of the most demanding on the soloist. Brahms told Clara Schumann that the gentle and hymn-like slow movement was ‘a tender portrait’ of her. Much of it is unforgettably beautiful. Here, pictured in sound, is the Clara the young Brahms fell in love with and never stopped loving, even though he remained a bachelor to the end. Written in a simple ternary form (this and the finale have cadenzas), the second movement perhaps cost him less trouble than the first. Then Brahms had to contend with the last movement. He decided on a traditional conclusion—a racing, rhythmically dynamic rondo: ABACABA. The last movements of Classical concertos were traditionally light, brilliant and vivacious rather than ponderous, and this one follows suit. Desperate to get the piece done, Brahms cribbed from the finale of Beethoven’s C minor Piano Concerto No 3. ‘The two finales’, Charles Rosen wrote, ‘may be described and analysed to a great extent as if they were the same piece.’ The sound is Brahms, though, not Beethoven. The tone is a non-tragic D minor, youthful high spirits with a driving, demonic, Hungarian/gypsy cast. Whether in the end the finale resolves the questions and tensions raised in the first movement is a subject of long debate, but there is no question that it makes for a thrilling conclusion. The premiere, with Brahms at the piano, was received politely but with quiet perplexity in Hanover. In its dark tone, its symphonic style and epic scale, this was a new kind of concerto. Then came the disastrous second performance in conservative Leipzig. At the end Brahms was hissed off the stage. In the wake of the Leipzig fiasco he broke off an engagement—the only one he ever had—with a young singer, and began to give up his hopes of being a true composer–pianist. With the D minor Concerto Brahms began his orchestral career with a work that shared something of the scope and tone—and key—of the symphony that ended Beethoven’s orchestral career. The results were powerful and original, and Brahms knew it, but his inexperience left its mark on the piece and he knew that too. He vowed not to take on something of that size and ambition again until he knew he was ready; he would not feel ready for another eighteen years, when he finished the First Symphony. But by the 1870s, he had the satisfaction of hearing this impassioned product of his youth cheered in concert halls all over Europe. Brahms avait du concerto une approche avant tout symphonique, à la plus grande échelle qui fût, et ses concertos sont de véritables épopées alpestres comparé aux grands concertos de Mozart, de Beethoven, mais aussi de Mendelssohn, de Schumann et de Dvorák, de dimensions et d’ambition plus modestes. Tous sont d’une exigence suprême pour le(s) soliste(s), même si ces deux concertos pianistiques ne font guère étalage de la virtuosité conventionnelle. Le soliste n’est pas, non plus, l’objet de toutes les attentions: il participe à un dialogue et, s’il reste sous les feux de la rampe presque sans discontinuer, cela demeure un dialogue symphonique. Le style claviéristique, lui, est grandiose, mâle, presque orchestral en soi. Cette approche brahmsienne, on la perçoit dès les premières pages du Concerto pour piano nº 1 en ré mineur, op.15, massif et théâtral, avec une sonorité et une juxtaposition de ré mineur et de si bémol majeur faisant écho à la Symphonie nº 9 de Beethoven. Ce concerto fut directement inspiré par des circonstances tragiques. En septembre 1853, Brahms, alors âgé de vingt ans, frappa à la porte des Schumann, à Düsseldorf. Brahms leur joua quelques-uns de ses morceaux. «Visite de Brahms (un génie)» nota dans son journal Schumann qui, peu après cette rencontre, rédigea un article, «Voies nouvelles», dans lequel il déclara que cet étudiant inconnu était non seulement un génie, mais qu’il allait sauver la musique allemande. Les répercussions furent énormes. D’un coup, toute l’Europe musicale connut le nom de Brahms. Lequel ne comprit que trop bien ce que Schumann avait, involontairement, fait: le hisser sur un piédestal avant même qu’il ait fait ses preuves. En proie à ce dilemme, Brahms apprit une bien plus terrible nouvelle: Robert Schumann avait tenté de se suicider en se jetant dans le Rhin. Sauvé des eaux, il fut placé dans un asile, où il mourut trois ans plus tard. Entre-temps, Brahms et Clara tombèrent amoureux (un amour plus ou moins inexprimé) et Johannes essaya de se dépêtrer du fardeau créatif que Robert avait posé sur ses épaules. Ce fut à cette époque qu’il écrivit, laborieusement et méticuleusement, son Concerto pour piano nº 1. Cette composition semble avoir été entamée en plein cauchemar de l’effondrement de Schumann. Dans la semaine qui avait suivi la tentative de suicide de Robert, Brahms avait esquissé trois mouvements d’une sonate pour deux pianos en ré mineur. Au fil des mois, cette sonate se mua en une ébauche de symphonie qui refusa de décoller. Finalement, Brahms recommença en gardant uniquement le premier mouvement, qu’il refondit en concerto pour piano. Ce fut sa première pièce pour orchestre et, de loin, la chose la plus ambitieuse qu’il eût alors tentée. D’emblée, il se trouva aux prises avec l’écriture orchestrale et la gestion d’une forme complexe, gigantesque. Mais il continua de travailler dur et, au printemps de 1858, au terme de presque cinq années atroces, il acheva les trois mouvements de son Concerto pour piano en ré mineur. Ce qu’il créa là demeure l’un des plus longs, des plus puissants et des plus formidables concertos jamais écrits. Il s’ouvre sur une note tragique à l’extrême, un inquiétant ré grave aux contrebasses et aux cors grondants avec, par-dessus, de frissonnants trilles débridés. À l’époque, cette ouverture était la plus turbulente du répertoire, avec une urgence expressive insurpassée à laquelle Brahms ne se refrotta que rarement. Toute cette œuvre tire certainement son élan de l’émoi juvénile du compositeur et son ouverture vertigineuse est presque cinématiquement l’image d’un désespéré se jetant à l’eau. Passé cette fulgurance inaugurale, le monumental premier mouvement s’éploie dans un climat de drame intense, en termes non pas programmatiques mais abstraits, pour une version brahmsienne de la forme habituelle du premier mouvement—exposition, développement, réexposition et coda. Dans une avalanche de thèmes, c’est un peu comme si le pianiste devait portraiturer tous les antagonistes d’un drame. Ce volet reste l’un des plus longs mouvements de concerto, l’un de ceux qui, physiquement et mentalement, exigent le plus du soliste. Brahms confia à Clara Schumann que le doux mouvement lent hymnique était un «tendre portrait» d’elle. Il est, dans l’ensemble, d’une inoubliable beauté. Voilà un tableau sonore de la Clara dont le jeune Brahms s’éprit et qu’il ne cessa jamais d’aimer, même s’il demeura célibataire. Écrit dans une simple forme ternaire (il comporte, comme le finale, des cadenzas), le deuxième mouvement lui causa peut-être moins de soucis que le premier. Puis, quand vint l’heure de se colleter au dernier mouvement, Brahms opta pour une conclusion traditionnelle: un rondo rythmiquement dynamique, lancé à fond (ABACABA). Plus léger, brillant et enjoué que lourd, ce dernier mouvement s’inscrit dans la tradition des concertos classiques. Voulant à tout prix en finir, Brahms plagia le finale du Concerto pour piano nº 3 et ut mineur de Beethoven. «Les deux finales», écrivit Charles Rosen, «peuvent, dans une large mesure, être décrits et analysés comme s’il s’agissait de la même pièce.» Reste que la sonorité est brahmsienne, pas beethovénienne. Le ton est un ré mineur tout sauf tragique, avec une pétulance juvénile, teintée d’une nuance battante, diabolique, hungaro-tzigane. On pourrait longuement discuter pour savoir si, au bout du compte, ce finale résout toutes les interrogations et les tensions soulevées par le premier mouvement, mais nul doute qu’il offre une conclusion palpitante. À sa création à Hambourg, avec Brahms au piano, ce concerto reçut un accueil poli, mais légèrement perplexe. Son ton sombre, son style symphonique et son envergure épique en faisaient un genre nouveau. Puis vint la désastreuse deuxième exécution dans cette ville conservatrice qu’était Leipzig: à la fin, Brahms quitta la scène sous les sifflets du public. Après ce fiasco, il rompit ses fiançailles—les seules de sa vie—avec une jeune chanteuse et se mit à désesperer d’être un véritable compositeur-pianiste. Avec le Concerto en ré mineur, Brahms démarra sa carrière orchestrale par une œuvre qui avait un peu la dimension, le ton—et la tonalité—de la symphonie avec laquelle Beethoven acheva la sienne. Le résultat fut puissant, original, et Brahms le savait; mais il savait aussi le poids de son inexpérience. Il se promit de ne jamais retenter quelque chose de cette taille et de cette ambition avant de se savoir prêt—il mettra dix-huit ans à se sentir prêt et achèvera alors sa Symphonie nº 1. Dans les années 1870, cependant, il eut la satisfaction d’entendre ce concerto passionné, fruit de sa jeunesse, acclamé dans toutes les salles de concerts européennes. Bei Solokonzerten pflegte Brahms vorrangig einen symphonischen Ansatz, und zwar im größtmöglichen Stil. Im Vergleich zu den kleineren Dimensionen und expressiven Ambitionen der großen Konzerte von Mozart und Beethoven, aber auch von Mendelssohn, Schumann und Dvorák sind die Brahms’schen Werke gebirgige Monumentalwerke. Alle Konzerte Brahms’ stellen außerordentlich hohe Ansprüche an den (oder die) Solisten, doch findet sich in den beiden Klavierkonzerten kaum konventionelle virtuose Effekthascherei. Zudem konzentriert sich die Aufmerksamkeit auch nicht nur auf den Solisten. In Brahms’ Konzerten ist der Solist ein Teilnehmer an einem Diskurs—ein im Vordergrund stehender und fast durchgängiger Teilnehmer, doch trotzdem Teil eines symphonischen Diskurses. In den Klavierkonzerten ist der Klavierstil gewaltig und volltönend, fast schon selbst als orchestral zu bezeichnen. Brahms’ Ansatz wird zu Beginn des Klavierkonzerts Nr. 1 in d-Moll, op. 15, deutlich: es tritt massiv und dramatisch auf und sein Klang sowie die Gegenüberstellung von d-Moll und B-Dur erinnern an Beethovens Neunte Symphonie. Die Inspiration zu diesem Konzert war sowohl tragisch als auch unmittelbar. Im September 1853 sprach der zwanzigjährige Brahms bei Robert und Clara Schumann in Düsseldorf vor und spielte ihnen einige seiner Werke vor. Als er sie wieder verlassen hatte, schrieb Schumann in sein Tagebuch: „Brahms zum Besuch (ein Genius).“ Bald nach diesem Besuch veröffentlichte Robert Schumann in der Neuen Zeitschrift für Musik seinen berühmten Artikel mit dem Titel „Neue Bahnen“, in dem er den unbekannten Studenten nicht nur zu einem Genie erklärte, sondern ihn auch als „starken Streiter“ in der Musikwelt willkommen hieß. Dieser Artikel setzte vieles in Gang und plötzlich war der Name Brahms in den Musikkreisen Europas bekannt. Brahms verstand jedoch nur allzu gut, was Schumann unabsichtlich getan hatte—nämlich hatte er ihn auf ein Podest gehoben, bevor er sich selbst bewiesen hatte. Als Brahms dieses Dilemma bedachte, erreichte ihn eine weitaus schlimmere Nachricht: Robert Schumann hatte mit einem Sprung in den Rhein einen Suizidversuch unternommen. Er wurde aus dem Fluss gezogen und in eine Nervenheilanstalt eingeliefert, wo er drei Jahre später starb. Während dieser Zeit verliebten Brahms und Clara sich ineinander (es war dies eine mehr oder minder unausgesprochene Liebe) und er begann, sich mit der schöpferischen Last auseinanderzusetzen, die Schumann ihm auferlegt hatte. Und in diesen Jahren arbeitete er auch unter Schmerzen und Mühen an seinem Ersten Klavierkonzert. Diese Komposition wurde offenbar während des alptraumhaften Zusammenbruchs Schumanns begonnen. Bereits eine Woche nach dem Selbstmordversuch hatte Brahms drei Sätze einer Sonate in d-Moll für zwei Klaviere fertig skizziert. In den darauffolgenden Monaten wurde die Sonate in einen Symphonie-Entwurf umgewandelt, der jedoch nicht recht gelingen wollte. Schließlich nahm er sich nur den ersten Satz noch einmal vor und arbeitete ihn in ein Klavierkonzert um. Dieser Satz war sein erstes Werk für Orchester und mit Abstand das Anspruchsvollste, was er bis dahin in Angriff genommen hatte. Das Komponieren für Orchester entpuppte sich sofort als stetiges Kämpfen, wobei er mit der gigantischen und komplexen Form rang. Trotzdem gab er die Arbeit daran nicht auf. Nach fast fünf qualvollen Jahren vollendete er die drei Sätze des Klavierkonzerts d-Moll im Frühjahr 1858. Sein Werk ist nach wie vor eines der längsten, kraftvollsten und beeindruckendsten Solokonzerte überhaupt. Es beginnt in äußerst dramatischer Weise mit einem ominösen tiefen D in den Bässen und knurrenden Hörnern, und mit wilden, bebenden Trillern in höherer Lage. Dieser Beginn war der turbulenteste im Repertoire jener Zeit und besitzt eine expressive Eindringlichkeit, die Brahms kaum je wieder erprobte und nie übertreffen sollte. Den Anstoß zu diesem Werk hatten sicherlich die Wirren seiner Jugend geliefert. Wenn man die schwindelerregende Eröffnung mit dem Bild eines verzweifelten, sich ins Wasser stürzenden Mannes in Verbindung bringt, so ist die Passage sozusagen filmreif. Nach dem schmerzerfüllten Beginn entfaltet sich der monumentale erste Satz in einer höchst dramatischen Atmosphäre, jedoch immer noch nicht in programmatischer, sondern in abstrakter Hinsicht—eine Version der üblichen Form des ersten Satzes eines Konzerts: Exposition, Durchführung, Reprise und Coda. Inmitten einer Fülle von Themen muss der Solist die verschiedenen, miteinander wettstreitenden Charaktere des Dramas darstellen. Es ist dies noch immer einer der längsten Solokonzert-Sätze, der für den Solisten zu den physisch und geistig anspruchsvollsten überhaupt gehört. Brahms erklärte Clara Schumann, dass der zarte und hymnische langsame Satz ein „sanftes Portrait“ von ihr sei. Vieles ist unvergesslich schön. Es wird hier Clara musikalisch abgebildet, in die sich der junge Brahms verliebte und die er niemals aufhörte zu lieben, obwohl er bis zum Schluss Junggeselle blieb. Der Satz ist in schlichter, dreiteiliger Form angelegt (dieser und der letzte Satz haben Kadenzen) und die Arbeit daran war möglicherweise weniger schmerzvoll gewesen als an dem ersten Satz. Dann hatte Brahms mit dem letzten Satz zu kämpfen. Er entschied sich für einen herkömmlichen Schluss—ein rasendes, rhythmisch dynamisches Rondo in ABACABA-Form. Die Finalsätze der klassischen Konzerte waren traditionsgemäß leicht, brillant und lebhaft angelegt und nicht schwerfällig, und diesem Beispiel folgt auch Brahms. Um das Stück endlich fertigzustellen, schrieb Brahms von dem Finale des c-Moll-Klavierkonzerts von Beethoven (Nr. 3) ab. „Die beiden Finalsätze“, so Charles Rosen, „können weitgehend beschrieben und analysiert werden, als seien sie ein- und dasselbe Stück.“ Das Klangbild ist allerdings reiner Brahms, und kein Beethoven. Der Ton ist ein nicht-tragisches d-Moll, jugendliche Hochstimmung mit einer vorantreibenden, dämonischen ungarischen Zigeunerbesetzung. Ob das Finale letztendlich nun die Fragen und Spannungen des ersten Satzes auflöst, wäre ein Thema einer langen Debatte; es besteht jedoch kein Zweifel darüber, dass es sich hierbei um einen packenden Abschluss handelt. Die Uraufführung in Hannover, bei der Brahms am Klavier saß, wurde höflich, aber mit leiser Ratlosigkeit aufgenommen. Der dunkle Ton, der symphonische Stil und die riesige Anlage offenbarten eine neue Art des Solokonzerts. Darauf folgte eine katastrophale zweite Aufführung im konservativen Leipzig. Zum Schluss wurde Brahms von der Bühne gezischt. Infolge dieses Leipziger Fiaskos beendete er auch eine Verlobung—die einzige, die er je hatte—mit einer jungen Sängerin und begann, seine Hoffnung auf eine Existenz als Komponist und Pianist aufzugeben. Mit dem d-Moll-Konzert begann Brahms seine Orchester-Karriere mit einem Werk, das in seiner Tragweite, seinem Ton und seiner Tonart Parallelen zu der Symphonie aufweist, mit der Beethoven seine Orchester-Karriere abschloss. Die Resultate waren jeweils kraftvoll und originell, und dessen war Brahms sich bewusst, jedoch hatte seine Unerfahrenheit ihre Spuren auf dem Stück hinterlassen, und auch dessen war er sich bewusst. Er schwor sich, nie wieder ein Werk dieser Größe und dieses Anspruchs in Angriff zu nehmen, bis er wusste, dass er dazu bereit war. Es sollte noch 18 Jahre dauern, bis er glaubte, bereit zu sein und seine Erste Symphonie vollendete. In den 1870er Jahren wurde ihm jedoch die Genugtuung zuteil, in den Konzertsälen Europas Jubel für dieses leidenschaftliche Produkt seiner Jugend zu ernten.